Join me for the Clarisonic #sonicrevolution Twitter chat on June 4, 2014! 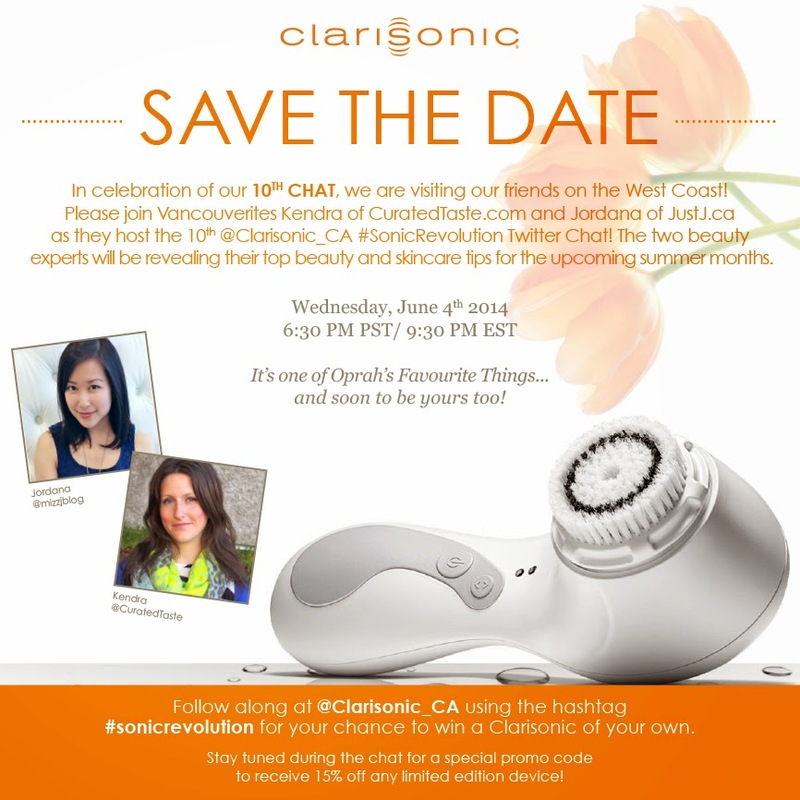 I am so excited to announce that I will be co-hosting the 10th #sonicrevolution Twitter chat for Clarisonic Canada! Join me and Kendra of Curated Taste as we discuss our experiences using the Clarisonic and answer your questions about the line! For those who aren't familiar with Clarisonic, they're basically a line of electric toothbrushes for your face. The vibrating bristles work like a gentle exfoliator, scrubbing away dirt, makeup and impurities to leave your face cleaner than just using your regular cleanser. You can use it with any cleanser and it's designed for all skin types! I've been using my new Mia 2 the past couple weeks to "prepare" for the chat and the quick review is that I love it! The Mia 2 is super convenient as it comes with a plug-in charger and travel case. It also has a very handy self-timing feature where it times how long you should apply the brush to each area of your face and chimes to let you know when to move on. Since using the Mia 2, I've noticed my skin has felt cleaner and more even. I was at first worried that it was a bit overkill for everyday use, but so far my skin has reacted well! I might consider changing it up during the winter dry months, but for now, I am quite enjoying the deep-cleaning sensation it provides. I'd love to hear your thoughts on Clarisonic and your questions about the tools, or anything skin care or beauty related during the chat! See you online!